The CallConnect on-demand bus service had a special birthday gift for its passengers, as it marked its 18th anniversary. To celebrate the milestone, CallConnect offered a day of free travel on Tuesday 19 March, with passengers able to travel for free on all pre-bookable and timetabled CallConnect services. CallConnect has carried more than three million passengers since its launch in Horncastle in 2001, seeing passenger figures rise to over 300,000 last year. Over the last 18 years, the network has expanded consistently since it started, with the latest addition being the Wragby and Bardney area. Buses operate throughout rural areas of Lincolnshire, North Lincolnshire, Rutland, Peterborough and East Northants with passenger able to book journeys from one week to one hour in advance. All vehicles are fitted with telematics and tracking and all new vehicles are fitted with CCTV for passenger safety. The 18th anniversary also introduces an updated livery. 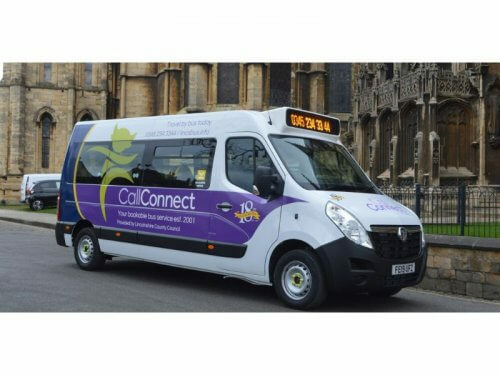 Cllr Richard Davies, the Executive Member for Highways, said: “CallConnect demonstrates our commitment to public transport, helping people in Lincolnshire stay connected even if they live in isolated or rural communities. “The growth in passenger figures reflects the value our residents’ place on this vital and innovative public bus service. Anita Ruffle, Head of Transport Services, added: “It’s great to be marking this latest milestone with significant enhancements to our fleet and a range of passenger offers in the coming months.